I get my inspiration from seeing what other artist are up too and what they are working on. It gives me motivation and makes me want to get involved more; I also get inspiration from a lot of the surf trips I’ve gone on with my partner. He’s taken me to places I probably would never have gone to normally. 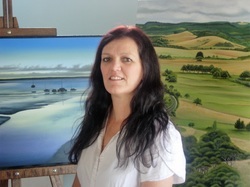 My favourite artists: Grahame Sydney: he captures landscapes that are just jaw dropping. Amber Emm: love those flowers!!!! Salvador Dali: he’s just interesting. My art has just improved by painting more. I'm always playing around with brush techniques. I do like a clean work space. I can’t work in space that’s messy, I need a clear head. The Royal Easter show was good, it always is. I’d like to enter next year. * What do you like most about Kumeu Arts Centre? What would you like to change/improve in Kumeu Arts Centre? Kumeu Arts Centre, it’s my art place. When I’ve got more time, I'm going to spend it down there for sure. It’s always good to mix with people who are into the same things you are. Also the progress is coming along nicely. It’s good for the community to have these special places. I wouldn't change the arts centre, it’s great! Maybe some more professional artist need to get involved a bit and give it a reputation!! !